So every week we have been going through a story in scripture where God called for someone to be sent, and highlighting different ways that people have responded to the calling. Always emphasizing that the proper response when the Lord calls is to say "Here I am Lord, Send me!" I want our student body to see themselves as sent men and women. We are all sent to bring the good news of the Kingdom of God to our classmates, to one another, to our families, to our friendships, to our college campuses, to our workplace, and to every corner of the world. A lot of these stories were shared at our annual Fall Camp. 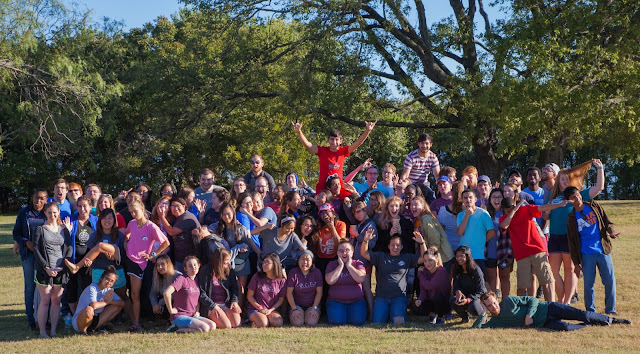 This year we took our students up to Camp Copass for a 2 day period of worship, games, reflection, and sharing. Not only did our students come away from this trip with deeper friendships. They also came a way with a deeper understanding of God's invitation for them to join Him in His work in this world, as well as a deeper conviction to respond to that invitation with a yes. One of the most encouraging stories I heard over Fall Camp was from one of our student leaders, Bryan Bass, who shared in front of our student body his experience of in his previous years of college, maintaining an incredibly busy schedule of working, and classes, and tutoring, and teaching, and how in all of this while he set aside time for attending Thursday Night Fellowship, and attending Core. It wasn't until this year that He responded with a "Send Me" to the Lord's call for him to be investing in the lives of his fellow classmates and peers in ministry. Bryan set aside much of the things in his life that had kept him so busy in years past, to instead make time to lead a small group of about 12 guys every week, along with his co-facilitator Matt Davis, with the aim of helping to shape the hearts and minds of young men, teaching them about the Lord, and bringing glory to God, by giving what he has to make disciples of our Lord Jesus. I have gotten to meet with several of those young men that are in that core group and they would be the first to tell you how deeply God has used their being a part of that core group to help them find and believe in God's goodness, by being reminded of the truth of the gospel, sharing in authentic friendship, and challenged to also say "Send Me" to the great commission that is given to all believers by Jesus. This is just a picture of myself and several of those young men that your investment is reaching. I fully believe that God is working of the hearts of these young men, and that he will use each one of them to further spread His kingdom, not only on the college campus in which they now live but in every area that their life will impact as they continue to live for him. I want to thank you for your investment and partnership with me in college ministry. Without you I would not have been able to as easily "Send Me" to the Lord's call on my life into ministry. I am so grateful for your gift. I am so encouraged by your friendship and prayers. Just as a side note and something to be praying for, if you would be so kind. Hayli and I are still adjusting to the costs of married life. And as a result I am currently still in a season of support raising. I will be sending individual letters to each one of you in the weeks to come, but if you would be praying about the possibility of either increasing support, or if you know of someone who might be interested in partnering with me in college ministry and would be willing to be contacted by me or receive a ministry letter. Would you please let me know? I love you all, and I am so grateful for what each of you has given to invest in the lives of these college students.